Melissa Witmer at a training session. 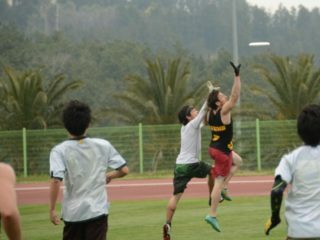 The long season is one of the many challenges of training for ultimate. You want to maintain what you’ve worked for, stay healthy, not get burned out, and perform at your best at the end of a several month grind. As we approach the club season in the US and Europe, here are a few rules to help you along. The main priority in-season must be to stay healthy enough to be on the field. Avoid training programs that are high risk, high reward. Who cares if you can increase your vertical by 8 inches if the next week you’re on the bench due to injury. Once you approach in-season timeframe, the opportunity for huge performance gains while on a safe long term program is already past. If this disappoints you, make a note of it and start your off season training earlier next year. Priorities will also help you to choose your most important workouts versus trying to do everything. Maintaining single leg strength is more important than working on your bench press personal record. When you can’t fit everything in, have a plan in advance for making sure you get your most important training work done each week. Many players stop lifting during the season because they accumulate fatigue in their legs and feel sluggish. But not lifting for 3-4 months leaves you open to a higher risk of injury and decreased endurance for your most important tournaments at the end of the season. If you feel a growing fatigue, a better option is to cut out some conditioning or cut out a few sets of exercises during your normal strength training routine. For more thoughts and ideas on this topic, see my previous post on Training In Season: Avoiding Two Common Mistakes. In the Ultimate Athlete Project we cut the lifting down to two days per week. And an upper/lower body split helps athletes to plan the lower body day around practices and tournaments. Having a solid leg day once per week is enough to maintain most of what you’ve worked for in the off season. The season brings the added stress of practices, tournaments, and travel. Pay some extra attention to what’s going on off the field in order to enhance your performance on the field. The first place to focus is your sleep. Are you allowing yourself time to get enough? Do you have a routine in place to help you relax if you have trouble falling asleep? Devote more attention to your nutrition habits. Protein is necessary for muscle recovery. Carbohydrates are vital for consistent performance in long practices and tournaments. If you don’t know what works well for you at tournaments, now is a great time to practice your tournament nutrition by experimenting with what you eat before practice or during warmup tournaments. Establish time to check in with your body. If anything hurts or doesn’t feel quite right, take this time to consider ways to fix it. After practice and in the mornings are good times to start this self-maintenance routine. Don’t over look minor pains –when left unaddressed, they can cause major issues later. Taking a full day or two or rest before and after every tournament would eliminate a lot of training time! Don’t be afraid of training frequently. Instead, be smart and keep an eye on your volume while keeping intensity the same. This means you still lift heavy and you still do sprints. Speed and agility work continued at full intensity to keep the nervous system operating as it should. If you feel fatigue accumulating day to day, cut back on the number of sets or repetitions rather than defaulting to skipping a training day. I am a big fan of shorter but more frequent workouts. Even the day before a tournament I like to do a short workout. This allows me to do a full warm up, keeping my movement patterns loose, and coordination patterns fresh. I feel more ready for the weekend having done a short workout than having been sedentary the day before. If you don’t want to go to the track because it’s raining, that’s not listening to your body, that’s being lazy. If however your legs are in a constant state of fatigue, an easy workout day is a good idea. Even if you don’t feel tired, if the weights you’re moving on leg day are decreasing even though you’ve been training consistently, this is a sign you need more recovery time. Every workout is a chance to measure yourself AND measure your training plan. Only a newbie to training will see gains every single workout. But for anyone, a sharp or consistent decrease in performance on a familiar workout is a sign you need to back off. Evaluate your training and recovery habits, form a new plan, and get back at it! The best defense against overuse injuries and fatigue in season is to have a solid off season program. Regardless, I hope that above rules help you stay consistent in your training without overdoing it. Good luck this season with whatever training plan you’re on! If your team is looking for an in-season plan, let me know! For the first time, we’re opening up the UAP to team memberships for in season training. We can give your athletes a simple program with appropriate volume to help them stay durable and move better this season. If you think your team would be a good fit for the UAP program, enter your email here, and I’ll be in touch!